I love a rapid-fire stash turnaround. It has oft been observed that the longer something stews in the stash, the smaller the chance it will ever get used. Thus, cutting into something within a week of it coming home with me is a wise move. This time it was one of the Savers scores from last post – the purple abstract screenprint which I bought thinking, will I have time to whip up a purple dress to wear on International Women’s Day? 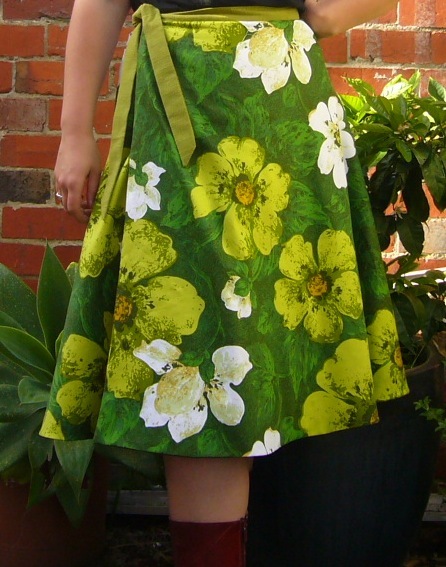 The top is Butterick 5032, a vintage reissue, while the skirt was improvised as I went. 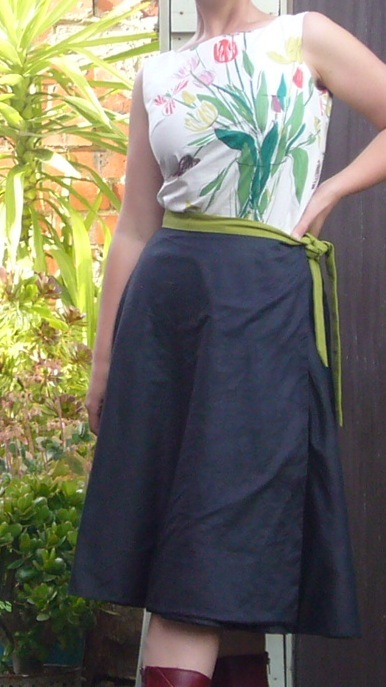 It’s very easy to chuck in deep inverted pleats around side seams and darts. Just sayin’. I wore it with a green cardie and white beads to complete the IWD suffrage tribute. Happy International Women’s Day. Shout the praises of your female heroes, role models and inspirations. I bought this amazing old dead stock 70s curtaining months ago thinking, “That would make a fabulously loud wrap skirt.” Only problem was that I didn’t have a wrap skirt pattern. 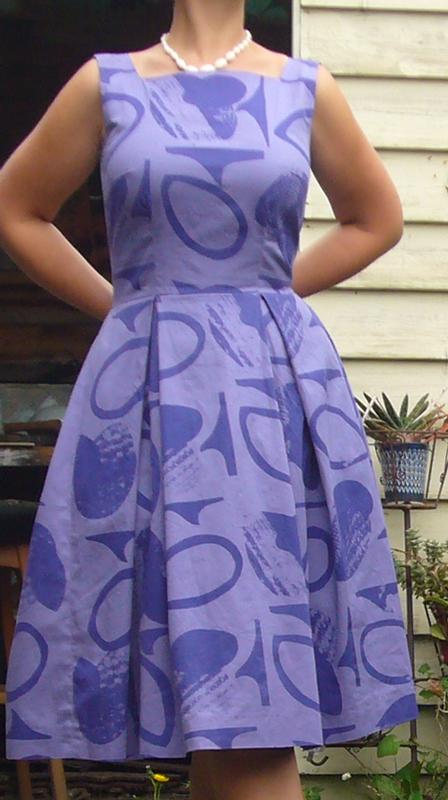 A chance encounter with Simplicity 7876 (see it on Vintage Pattern Wiki here) in an op-shop yesterday. It remained virginal and uncut for about 2.5 hours until I launched into it with gusto. And, presto! I didn’t have enough to make the tie but I had a tiny scrap of green barkcloth left from a curtain I bought from a church sale about 10 years ago which has since been used for 234,673 projects – among them a plush alien, a ukulele case and quilt binding. It’s treated me well. Look at that! The clever thing’s reversible! Two skirts for the price and effort of one! Convertible, reversible, desirable! Coupled here with the tulip blouse of last post. I took this ensemble dancing last night and both of us enjoyed it very much. 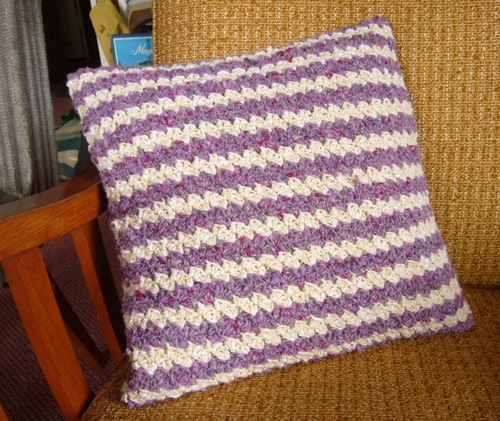 I also made a housewarming present for a friend … it’s a kind of chimera craft, part crocheted, part sewn. How unholy. The back is mauve velvet. He likes purple. I don’t. He gets a purple cushion and I rid my wool/fabric stash of purpleness. We both win!